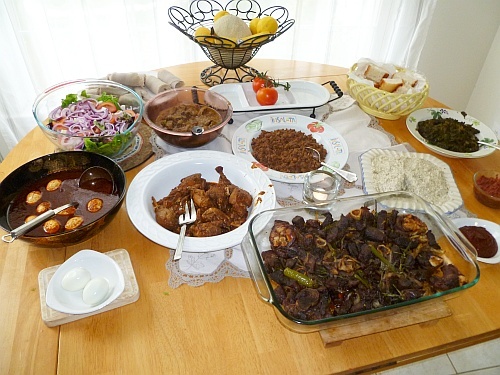 Ethiopian cuisine consists of spicy vegetable and meat dishes cooked as stews or sauces called wat (or wot) which are served on top of sourdough flatbread (injera) made of teff flour. 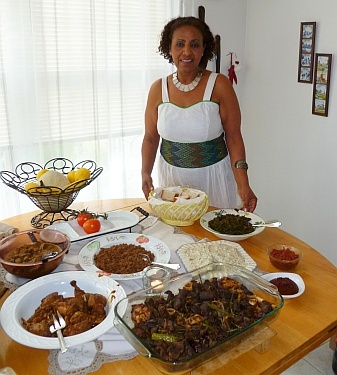 I had the opportunity to try some home-cooked Ethiopian dishes prepared by my friend Kebede to celebrate Easter. The menu included a variety of dishes. Vegetable salad with lettuce, tomato, avocado, and chunks of feta cheese. Rinse and dry the chicken pieces. Marinate them in lemon juice and salt for 30 minutes. Cook the onions over moderate heat for about 5 minutes in a heavy stew pot. Do not let brown or burn. Stir in the butter, garlic and spices. Add the berbere and paprika. Sauté for 3 minutes. Pour in the wine and water and bring to a boil. Put the chicken into the boiling sauce. Cover and simmer in low heat for 30 minutes, adding water as necessary to maintain a sauce-like consistency. 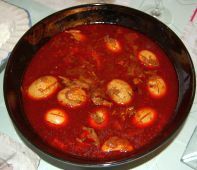 Add the hard-boiled eggs and turn them gently in the sauce. Cover and cook the doro wat for 15 more minutes. Add pepper to taste. Ethiopia is a landlocked country situated in the Horn of Africa. The official language of Ethiopia is Amharic, which is a Semitic language. Approximately two-thirds of Ethiopians are Christians, and the rest are Muslims or have other faiths. 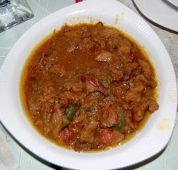 Ethiopians usually do not consume pork. Ethiopians like flavorful food and use a powder called berbere in many of their dishes. The powder contains ground chili peppers and spices such as ginger, cloves, coriander, and allspice. Traditionally, no utensils are used when eating. 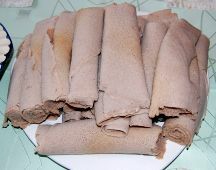 Ethiopians take a piece of injera with their right hand and use it to pick up bites of entrées and side dishes. 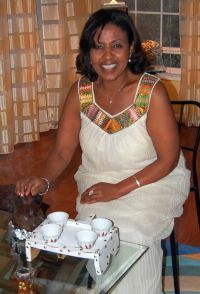 Coffee originates from Ethiopia, and the beverage is served with great pomp. A coffee ceremony involves burning of frankincense, and the coffee is usually boiled and served from a clay pot called a jebena into small cups similar to those used for expresso.